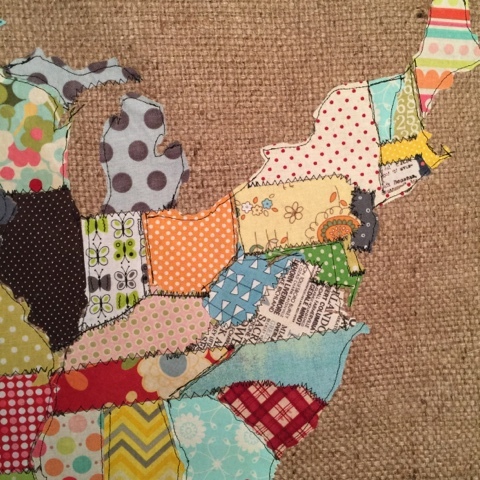 Make a fabric map using just scraps! 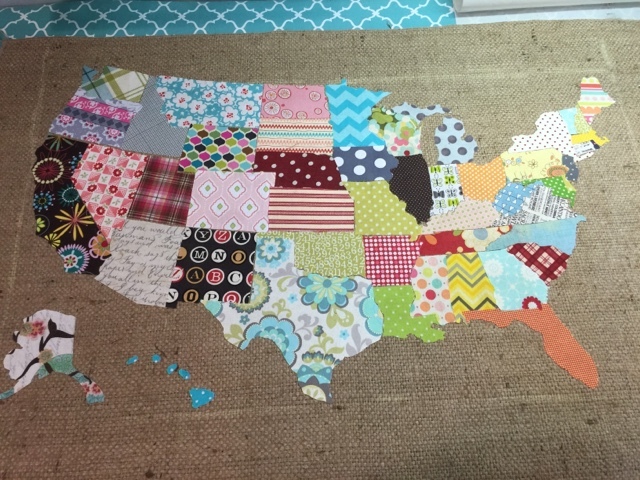 I am just in love with the the "scrap maps" I have been seeing recently!! I decided to try making one myself for my craft room. I have so many pieces of scrap fabric I figured this would be a great way to use them! I just pulled from the bin, 50 different pieces to use! It was so hard to resist the urge to coordinate it all. First I downloaded the states from Dream a little bigger she has each state ready to download and import into the silhouette!! You can then cut them out using your silhouette cameo machine! I couldn't decide exactly how I wanted to do this so I tried cutting the fabric with the silhouette directly first. The only problem with this is it was very tedious to cut each scrap to fit the state and then arrange them all the right way on the mat. 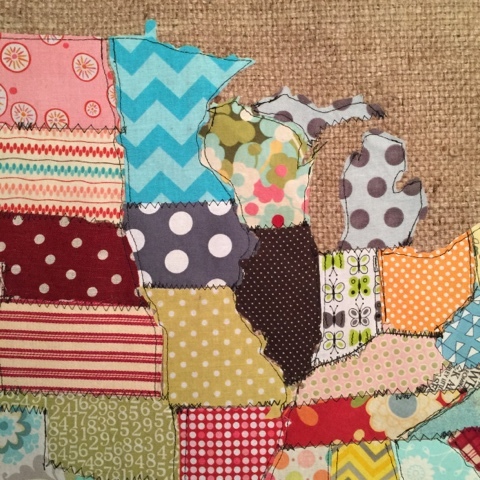 Next try- cut the states out of heat n bond, iron onto fabric and hand cut! That worked! That went much quicker!! Now I will tell you, the states are not all the right size. Most of the east coast is too big, you will need to re size them before you cut! See New Jersey here, way to big! Once I had all my shapes sized to fit like a puzzle &amp; cut out, I appliquéd them to the burlap! 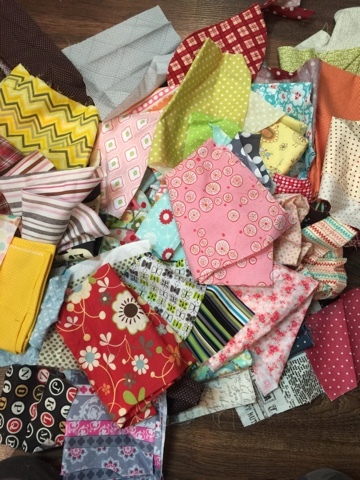 Next up, the sewing. I did not want this to be super perfect. I call it intentionally messy! Zig zags and straight stitch! I used black thread and simply started sewing. This took a lot less time than I thought it would! And I just love the result!! Tonight I'll be mounting it and finishing the edge! I can't decide, scrap edge or fray the burlap?! I can't wait to hang it in my room!! I do plan to mount it to a painted board and hang on the wall. There are so many ways you could do it! I will also be adding this to my shop in March after I get back from a much need week in the Dominican!!! Stay tuned! You can follow The little Green Bean on instagram for updates on the maps, and so much more! I LOVE this! Been kind of obsessesed with US maps lately and would really like to do this version. I would embroider a star to mark home and on each city where my grown kids live. Thanks for sharing! So inspiring! I want to do one of Canada (where I live). Thank you for this post. I just made this and I love it!!! I plan on attaching two dowels, on top and bottom and hanging it with twine…like the old fashioned maps. I love it I’m going to do as soon as I finish building my model doll house ? I’ll have to make one! 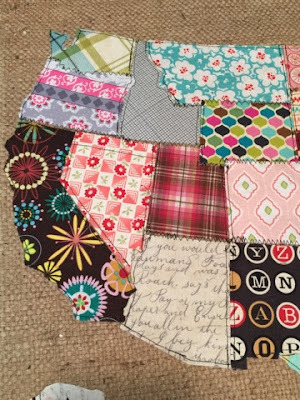 I am “old school”- When I am ready- I’ll cut up an old-fashioned map for the pattern! Guaranteed the pieces will fit! If you have photoshop, you can enlarge a map coloring page—found via pinterest—and then print one section at a time on a regular printer. Use the ding maps font (free) to print out the shapes as pattern pieces (import the font into your computer) or use the font in your Silhouette machine to cut them out. 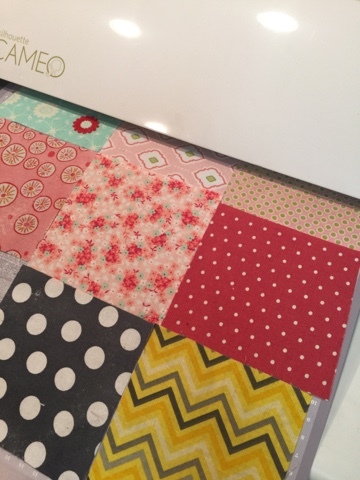 I really love the idea of this quilt, but how do I open the files since I don’t have the cutting device indicated. Is there a way to convert the files to Adobe PDF files? I can’t open the patterns for the states?? What a cute idea and do want to make one for myself and maybe one for my sister. 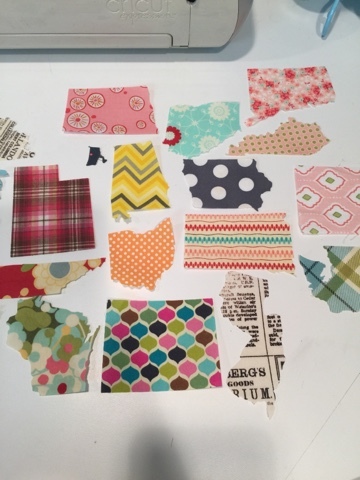 Please help me download these patterns. This looks wonderful! I have a technical question – How did you know how to resize the states that were too big?? Did you just keep trimming until they fit? Thanks! How come program will not open to get pattern for states? I could be wrong, but I think there must be some kind of software for the Silhouette Scan and Cut machine. I don’t have any kind of scan and cut machine, so I’m not sure just how it works, but that’s what I think. If you have a Silhouette then you should be able to use the downloads. I know my downloads won’t open either. My computer won’t open this either. As the person asked about any suggestions??? Says the program not compatable. I am unable to get to the state patterns. My computer says it can’t open it. Any suggestions or help would be appreciated. Thanks. I just LOVE your work!! It’s SO inspiring! Can I ask tips on heat bond? I feel like sometimes my edges stick and sometimes they don’t? I follow you on Instagram and everything you come up with is super neat!! Thank you! I’m in love! I will have to make one! I absolutely love this!! 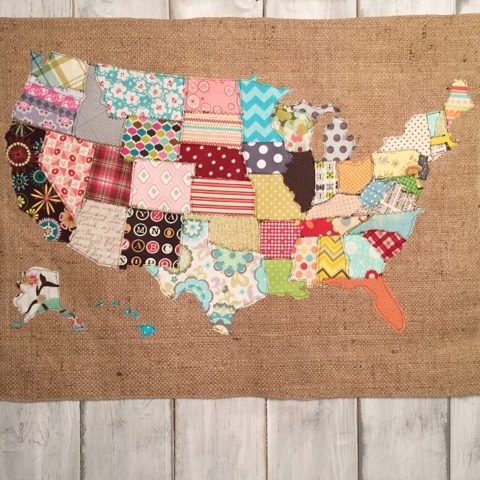 I love burlap, and am working on a project with the US map for a present, and this is perfect!! I don’t have all the resources you do for cutting the states out, so will have to improvise somehow. But, this is just so wonderful, thank you for sharing! !